Secret Hitler is a dramatic game of political intrigue and betrayal. Players are secretly divided into two teams and become either liberals or fascists. Known only to each other, the fascists coordinate to sow distrust and install their cold-blooded leader. The liberals must find and stop the Secret Hitler before it's too late. Join the suspense and secretive game of Secret Hitler. This game will make you want to play again and again and can be a blast for a fairly large group of people. Dim the lights, turn on a lamp and set the scene for this new party game. 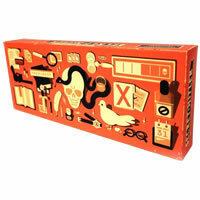 Give Secret Hitler a try today. There are various ways to win. See the official game rules for more details. Inside are 17 policy tiles, 10 secret role cards, 10 party membership cards, 10 card envelopes, 10 Ja! ballot cards, 10 nein ballot cards, an election tracker marker, a draw pile card, a discard pile card, 3 liberal/fascist boards, 1 president placard, 1 chancellor placard and the official Secret Hitler game rules and instructions. Please keep in mind that the official Secret Hitler party rules and instructions could be different depending on the game version you have. The rules below are some of the exact directions on how to play Secret Hitler. Share with us your comments, funny stories, tips, advice, strategies, creative ways to play, questions about how to play, problems with the rules or anything you want about Secret Hitler. All submissions will be reviewed within 24 hours. Click here to add your Secret Hitler comments.